Rainbow Falls, one of the more memorable Hawaiian waterfalls. Hawaiian waterfalls are far too numerous to count. Tucked away in secluded valleys or viewed across great landscapes, tourists can enjoy exploring these majestic falls. Below are some of the most beautiful Hawaiian waterfalls in the Aloha State. Waipo’o Falls: Waimea Canyon is referred to as the “Grand Canyon of the Pacific.” So it’s no surprise the double-tiered 800-foot Waipo’o Falls would be equally as astounding. For closer views, take the Canyon Trail between mile marker 14 and 15. Here, you can enjoy a staggering perspective of the canyon from the top of the falls. 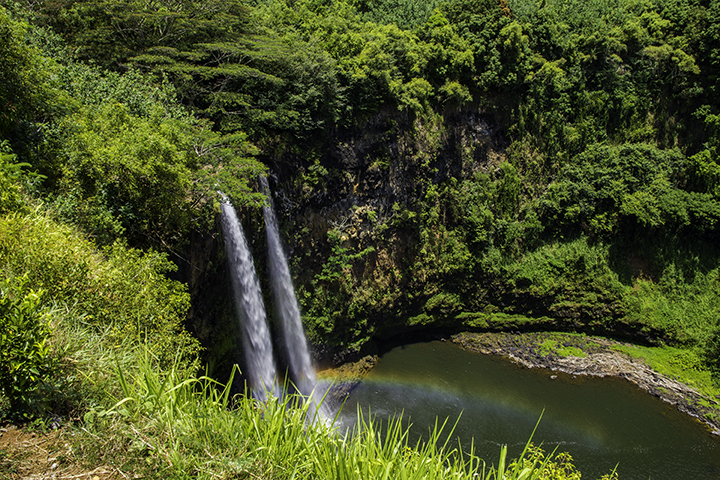 Wailua Falls: Perhaps one of the most idyllic waterfalls on Kauai, the 80-foot Wailua Falls will take your breath away. Off Highway 56, visitors will want to behold its beauty for several minutes. Be advised. Even though the pool is about 30 feet deep, diving into these waters has proven fatal. Manawaiopuna Falls: Forever immortalized in the popular film Jurassic Park, this enormous waterfall is located on private land. Accessible only by helicopter, this waterfall is a popular attraction on the helicopter tours of Kauai. Hanakapi’ai Falls: Situated between the Na Pali Coast and Hanakapi’ai Valley, you can access this waterfall without a permit or being part of a tour. Visitors can hike to the 300-foot falls through a trail, crossing streams and verdant jungle paths. Waimoku Falls: Hiking to the towering Waimoku Falls at the end of the Seven Sacred Pools is not for the faint of heart. One of Maui’s best hiking trails covers nearly 4 miles round trip and ascends almost 650 feet. It requires a hike of 2 to 3 hours, assuming no breaks. However, the trip is worth the effort. 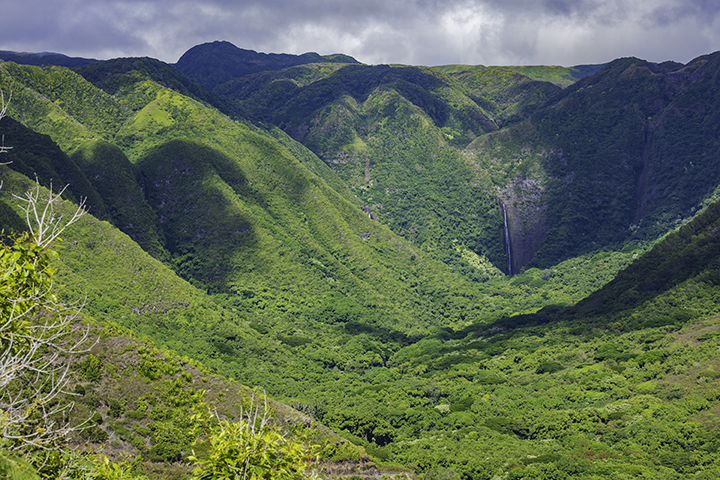 The trail also passes Makahiku Falls and ends with Waimoku Falls, Maui’s tallest waterfall. Wailua Falls: Tumbling a breathtaking 80 feet, this waterfall lies beyond mile marker 45 on the Hana Highway. Although its volume varies on the amount of rain, Wailua Falls on Maui is always a beautiful tourist stop. Upper Waikani (Three Bears) Falls: Whether rainfall has turned it into a trinity of trickling cascades or a deluge, the Upper Waikani is not to be missed. Located between mile marker 19 and 20 on Hana Highway, this three-tiered 70-foot waterfall makes a great stop. Rainbow Falls: No list of memorable Hawaiian waterfalls would be complete without Rainbow Falls. As the resting place of King Kamehameha’s father, this waterfall has great aesthetic and historic value. 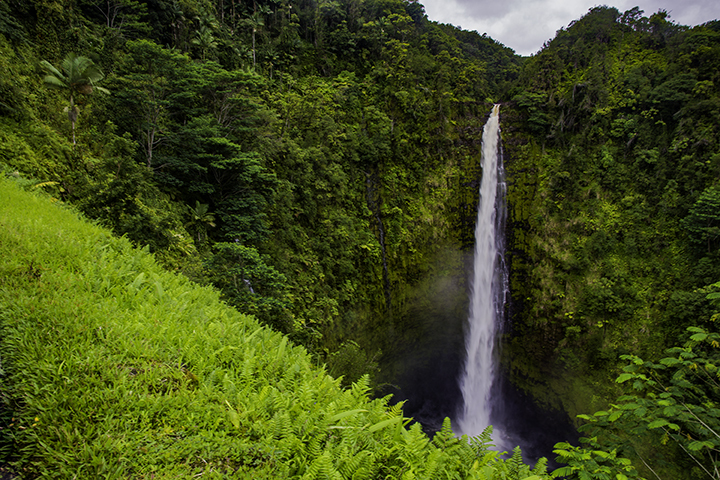 Akaka Falls: Near the Hamakua Coast, this stunning 420-foot waterfall is one of the largest waterfalls in the State. Here, travelers will hear the waterfall long before they see it. The nearby Kahuna Falls is noteworthy as well, but not as easy to view as Akaka Falls. 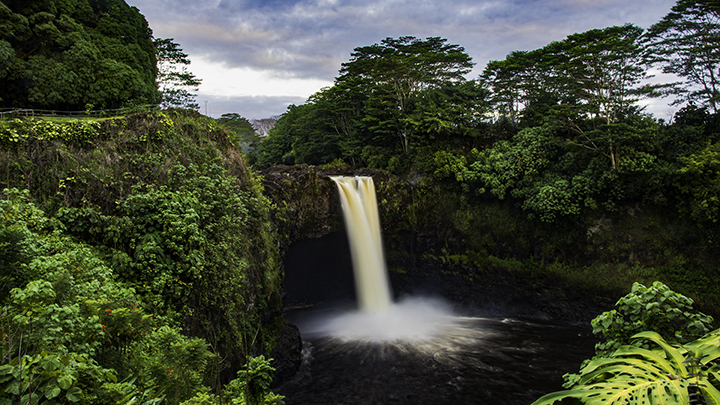 Pe’epe’e Falls: This subtle waterfall feeds into the famous Rainbow Falls creating a wide pool below. The 60-foot high falls attract mosquitoes; so visitors should use insect repellent. Sacred Falls: Oahu has a 1,100-foot high beauty of a waterfall called the Sacred Falls. Hiking there is no longer permitted for safety reasons. But visitors can still see the massive cascade by helicopter. Waimea Falls Park has smaller waterfalls where guests can go swimming. While Manoa Falls, only about 20 minutes from Waikiki, is about 150 feet tall. Moaula Falls: Moaula Falls in Halawa Valley is an astounding multi-tiered waterfall with the lowest tier plummeting more than 250 feet. The falls is on private property and you will need the owner’s permission to visit. Visitors can also get a bird’s-eye view of the connecting Moaula Falls by helicopter. Papalaua Falls: One of the tallest waterfalls in the State, Papalaua Falls plunges over 1,200 feet. This waterfall is utterly spectacular. Although there are countless falls on Molokai, this one is worth boarding a chopper to witness.